A bracelet which belonged to an Irishwoman serving with the US Army Nurse Corps in France in World War I has been returned to her relatives in Bray, Co Wicklow after a worldwide search. 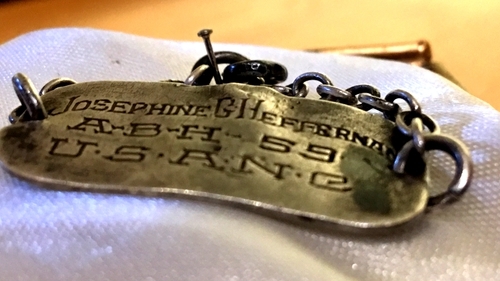 The bracelet inscribed with the name Josephine Heffernan was discovered fifteen years ago by an eight-year-old boy in a schoolyard in Rimaucourt in northeastern France. He brought it to his teacher, Estelle Lefeuvre, who promised to help him find the owner. It was not until after she retired that Ms Lefeuvre began researching Ms Heffernan. She linked the bracelet with World War I and discovered the Americans had a base in Rimaucourt. The school had been used as an army hospital and she concluded that Ms Heffernan had been an army nurse. However, she could not find any further records. Ms Lefeuvre was joined in her search by international nurse historian Marjorie DesRosier and documentary-maker Hélène Lam Trong. "I was fascinated by the idea of finding out who this woman was. It was a gamble to see if we could find her, but the gamble paid off," said Ms Lam Trong. Initially, their search was concentrated in the US, as they believed Ms Heffernan was American. They eventually discovered a death record showing the nurse to be Irish and buried in Bray. After making contact with the Bray Cualann Historical Society, more details about Ms Heffernan's cosmopolitan life emerged. She had emigrated to the US in 1906 and joined the army in 1910. She was posted to France in 1918 to work at a base in Rimaucourt, where the bracelet would eventually be found. She kept photographs of her time there, as well as albums which document spells living and working in South East Asia, the Philippines and Hawaii. Having retired, she returned to Bray in 1943. She had never married and did not have children. She died in 1962 and was buried in St Peter's Church with the American flag draped over her coffin. Yesterday, Ms Lefeuvre travelled to Bray to return the bracelet to Ms Heffernan’s relatives. The episode was filmed for a documentary being made for French television by Ms Lam Trong. "I never knew Josephine but through my research I feel I know her like a friend. After all these years of trying to find her, coming to Bray with the bracelet is like bringing her home," Ms Lefeuvre said. The documentary "Josephine H" will be broadcast in France later this month.